Police said the car rolled over several times before coming to a rest. 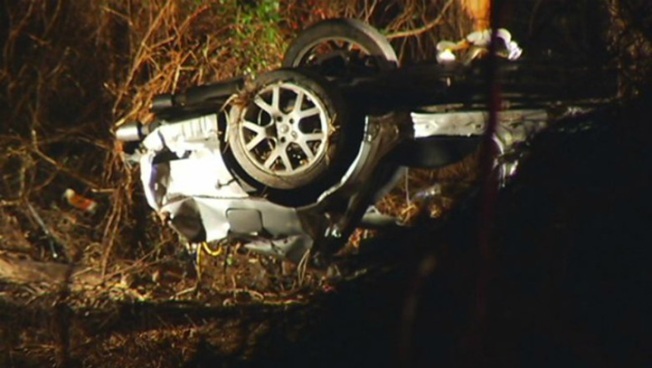 A man and woman from Rhode Island were killed in Westport when a car they were traveling in went off the road and landed in an embankment early Sunday morning. State police said they received several 911 calls just before 3:30 a.m. reporting a car going off the road on Interstate 95 northbound between exits 18 and 19. The 2005 Altima was traveling in the left lane and moved into the right lane of the highway police said. The car went through a guardrail and rolled over several times before ending up on its roof in an embankment. Terrance Bernard, 46, and old Savannah Wakely, 25, of Woonsocket, Rhode Island were pronounced dead at the scene. The driver, Jarmain Allen, 32, was sitting on the guardrail when emergency crews responded, police said. He was transported to Norwalk Hospital and had been released as of Monday afternoon. Jennifer Shaver, 27, a passenger, was transported to St. Vincent's Hospital with serious injuries. Both occupants reside at 271 Bronx Ave. in Bridgeport. The accident is under investigation. Anyone with information is asked to call State Police Troop G barracks at 203-696-2500.